Horse racing has a long history in American sports. Though many states are only just now legalizing and regulating sports betting, online horse betting is available in most states. Betting on horse races has a learning curve that a new bettor will have to navigate. You need to learn the types of online horse racing bets and what are the horse racing events. Finally, you’ll need to find a quality online horse racing book. Our quick guide can get you started on your online horse race betting journey! What states allow online horse race wagering? Our guide is also a great place to get started researching the upcoming Triple Crown, one of the biggest American horse racing events of the year. You get three high profile races starting with the Kentucky Derby, then the Preakness Stakes, and finishing with Belmont Stakes at Belmont Park. We’ve selected our favorite online horse betting apps and sites based on a few criteria. A good horse race betting app needs to be available in multiple states. Horse betting sites should cover as many tracks as possible, including global tracks. A variety of handicapping and tips should be at every bettor’s disposal, both free and paid tips. It’s impossible to make educated bets without reliable, accurate, and extensive information about Jockeys and their horses. BetAmerica is rightfully at the top of everyone’s short list for best online horse racing bookmaker. Covering up to 5000 races per week across the globe, bettors can always find a competitive and exciting horse race to wager on. Easily sort races by type and using a variety of filters, you can easily select the wagers you want to add to your betting slip. With BetAmerica Extra, you can get free live video streaming of every race but guides of literally every race track that BetAmerica supports wagers on. This information can be invaluable when comparing a horse’s previous performances. TVG stands out because of their easily available tips and handicapping. At TVG, you can get free past performances, races replays, expert daily picks, and access to the TVG blog. They also have tutorial videos to help out those new to horse betting. TVG also have space for live videos of horse races. Just login, make your wagers, and find your race from the track list dropdown menu to monitor your slip in real time. TwinSpires should be your favorite if you’re an annual bettor on the Kentucky Derby. Twinspires is the official partner of this American classic that heads off the Triple Crown. You can look forward to special content regarding this horse race. Of course, other global races and tracks are supported on TwinSpires as well. You can find special information about them in the blog section, thoroughbred news, and content about harness racing. When you place a Select to Win bet, you are simply calling the winning horse of the race. This is the most common type of horse racing bet, by far, and the payoff of the bet is in the medium range, with odds higher than Place and Show bets. Show bets only require that you pick a horse that places top 3 in the race. Since it is much easier to call a horse that finishes in the top three, the odds are on the lower side. When it comes to place bets, your horse must finish the race in either 1st or 2nd place for you to win. The odds for a Place bet are higher than a Show bet but lower than a Select To Win bet. Exacta bets require that you choose the 1st and 2nd place finishers in the exact order of their finish. If you pick the two top horses in reverse order, your bet will still lose. The odds on Exacta bets are much higher than Show, Place, and Select bets. With Trifecta bets, you pick the top three finishers of a race in the correct order. Due to the relatively low chance of picking the top three winners, the odds on trifecta bets are extremely high. Daily Doubles are special bets that give you the chance to choose the winner of two consecutive races at a track. These bets are not available for all races. Daily double bets are similar to betting on a parlay bet between two Select to Win bets. With Pick 6 bets, bettors must try to select the winners of six consecutive races. Because of the extreme difficulty to pick six straight winners consecutively, a successful wager gives HUGE payouts- sometimes worth millions of dollars. Read about this Texas woman that won $1.2 million on a Pick 5 bet. If online horse racing isn’t really your thing, you can gather more information about sports betting and how to read odds with this guide. There are two main types of horse racing to bet on, thoroughbred races and harness racing. 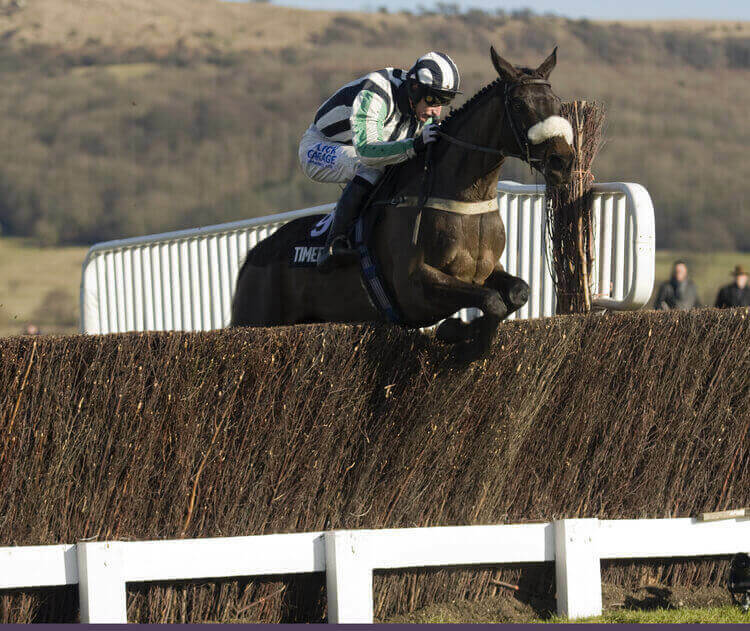 Within thoroughbred racing, there are two further subcategories called flat racing and “jump” or steeplechasing. Don’t worry, we’ll explain them all here. This is what most people picture when thinking of horse racing. A jockey on the back of a horse going around a dirt track. The Triple Crown is run with thoroughbred horses. The racing distances ranging from 2 furlongs (402 meters or about once around an outdoor running track) up to 3 miles. Shorter distances are to see how fast a jockey can push a horse while the long ones are a test of stamina and the ability of a jockey to control a horse. The shorter distances are better suited for flat racing while jump or steeplechase races tend to be a bit longer. The simplest and most popular type of horse racing in the US. Just a jockey on a horse going around a track with no obstacles in the way. These races are built for speed. The fastest horses can complete a 1-mile race in a little over 1 minute and 30 seconds. More popular in Britain than in the US, although it still has a presence here. Jockeys run horses through a track with obstacles. Usually, they’re hurdles (neatly trimmed bushes and hedges) and ditches filled with water. It’s similar to the steeplechase that you sometimes see runners doing when watching the Olympics. Steeplechase horse racing is much more controlled and measured. The jockeys are technical specialists and great a managing the horses they ride. In this type of horse race, horses pull a two-wheeled cart occupied by the jockey. The cart is called a sulky. Harness racing can be done at a trot or a pace (two distinct types of running that horses can do). Harness racing also involves a lot of control on the part of the jockey. Not only do they have to keep their horse running with the correct gait, they have to control their own cart and watch out for the competition. Crashes can spectacular because of the extra equipment and sometimes result in serious injury. At online horse racing bookies, you get access to more than just odds and different types of bets. You find that most major horse racing bookies in the US provide a large range of resources such as handicapping, past results and replays, predictions, and even live streams. Use these resources to the fullest to gain an advantage when placing your bets. Make informed bets if you want to win and don’t just rely on your intuition. The live stream of horse races, in particular, can be one of your most important assets. It’s great for assessing track conditions. For example, if you know that a particular favorite tends to underperform in rainy, sloppy conditions, you just might be able to capitalize on some great odds by betting on an underdog. You can usually get access to live streams as long as you have money in a sports betting account. All the big races are shown but you can also find many smaller venues that live stream to sports betting sites as well. Handicapping in horse racing means that horses of different skill levels will compete in a single race. What bookmakers do is give certain horses different weights so that the likelihood of any horse winning is the same. Faster horses get bigger weights to make it more even against the slower horses, for example. As far as betting on handicapped horse races is concerned, the skill comes in knowing which horse will overcome their handicap. These types of odds options are great for bettors that follow horse racing closely. Most online horse racing bookies in the US provide access to odds via a browser-based client and through a mobile app. Mobile apps have the same functionalities as browser-based clients including quick deposits, live streams, and mobile registration. You can download mobile apps via the iTunes or Google Play stores based on the operating system your mobile device uses. 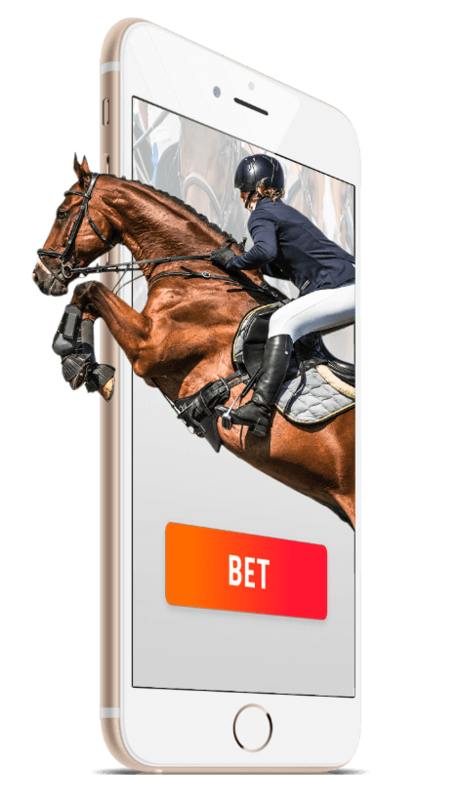 Mobile betting is very useful to bettors who are constantly on the go and enjoy betting and watching their favorite horses from the road. Visit the bookie’s website and click on the Sign-Up button, usually at the top right of the page. Fill out your personal details like Full name, Phone Number, Email Address, Birthdate, Mailing Address, and the last 4 digits of your SSN in the registration form that pops up. Create a unique Username and Password for you betting account (write these down). Look for a “Promo Code” field and check US-Bookies for relevant bonuses. Complete the registration process by reading the relevant Terms & Conditions and pressing Register. Use customer support if you run into any issues. Email, phone, and live chat are popular support options.